Choose a frame color, then pick from our selection of coordinating accessories to give your office a unified look and feel! Hefty desks and conference tables deserve a little elevation from time to time. Don't hold your workstation back from achieving better ergonomics just because it's heavy; the UPLIFT Four-Leg Adjustable-Height Standing Desk Frame is your go-to height adjustable desk frame for larger work surfaces. Sturdy enough to support large desktops and even conference tables up to 530 pounds, each leg comes with a quiet, built-in motor, giving you quick adjustments from sitting and standing every time. Our 4-leg desk frame offers more stability than most standard 2-leg desk setups, and was designed by a Certified Professional Ergonomist, ensuring that you'll have a reliable and ergo-friendly workstation to keep you working for years. The frame is ready to pair with your current desktop, or peruse our selection of wallet-friendly laminate or eco tops, or try a luxurious solid wood or reclaimed wood top for even more style for the office. Choose from three frame colors to have a personalized desk you'll appreciate from the first use. *Because the brackets allow for custom placement of the legs on your desktop, you will need to make sure the desktop you put on this frame is stiff and not prone to bending or sagging. For desks up to 72" wide (and 30" deep), we suggest at least a 1" thick real wood or high quality laminate, similar to the GREENGUARD laminate we use on our full four leg desk. For desks larger than this, we recommend a 1.5" or thicker top. My memory presets don't seem to work on the Advanced Keypad. My desk only moves up a little bit when I press the button. Is something wrong? Which version of control box do I have? If you want to know if you have the most up-to-date control box on your desk, you can check to see which version of control box you have by glancing at the silver label on it. If it says v4.1, v4.2, or v4.3, you know you have the newest version of UPLIFT Desk's control box, version 4, complete with new features! The newest version of UPLIFT Desk's control boxes comes with a new safety feature - Collision Sensitivity, which allows you to set the sensitivity for your desk, so when adjusting your desk stops when it comes into contact with an object, instead of continuing to raise or lower. You'll also be able to switch between inches and centimeters on your keypad. Keypad Lockout is another new function you'll love, which lets you lock the desk to keep unwanted hands from adjusting it. And you'll enjoy the newfound ability to toggle between One-Touch and Constant-Touch modes with just a few buttons. Read about how to access these awesome new features on our blog post about it! Do I have UPLIFT Desk's newest 4-leg frame design? UPLIFT Desk's newest 4-leg frames started shipping in all colors early 2018. The new design comes with an updated control box and crossbars for more desk stability. Customers who have older versions of our frame will not have these crossbars. If you have questions or want to upgrade your desk to the newest design, reach out to our Support Team and we can help make it happen. The control box for the 4-leg Adjustable Height Frame is configured so that each leg must be attached in order for it to operate. This is a safety feature so that the desk won't operate when one of the legs isn't working or fully connected. Can I put a very large but thin laminate top on this frame? No, a thin, large laminate desktop will bow over time. Consider using a thicker desktop so that your desk is as stable as it can be. Yes, if you have an older UPLIFT Desk 4-Leg Frame, you can contact our Support Team to see which additional pieces can be purchased to make your older model new again! Will this desk work with my outlet and voltage if I live outside of the Unites States? All UPLIFT Desk frames are designed to run on the US electricity standard of 120V. This means if you are ordering an UPLIFT Desk frame from outside the United States (minus Canada), you'll need to plug it into a step down transformer (sold separately). If you don't use a transformer you run the risk of overloading your control box, which is not covered by UPLIFT Desk's warranty. If you have any questions at all regarding how your country's voltage and outlets work with this frame, please contact us. Why would I need a 4-leg frame? A 4-leg frame is most useful on an oversized or unusually-shaped desktop. It is also beneficial if you are using your desk for tasks that are more vigorous than standard office work, such as an automated sewing machine or a turn table. For a standard office desk with your average electronics, you probably won't come close to using the full 530 lb weight capacity of the UPLIFT Desk 4-Leg Standing Desk Frame. Are there any restrictions to the type of desktop that I can attach to this? You will need to make sure the desktop you put on this frame is stiff and not prone to bending or sagging. This 4-leg frame is compatible with our 60" x 30", 72" x 30", and 80" x 30" desktops. For desks up to 72" wide and 30" deep, we suggest at least a 1" thick real wood or high quality laminate, similar to the GREENGUARD laminate we use on our UPLIFT 4-Leg Desk. For desks larger than this, we recommend a 1.5" or thicker top. While the weight capacity offered by the 4-Leg Desk Frame is 530 lbs versus the 2-leg frame's 355 lb weight capacity, the stability offered by each frame is about the same. What's so important about having a motor in each leg? All UPLIFT Desk 4-leg desks come with a motor in each leg, so frames are stronger, safer, quieter, and more reliable. Don't settle for anything less than the best, go with UPLIFT Desk for the complete desk package. Yes, all of our UPLIFT Desk Frames are 50 decibels quiet. We do not recommend using a glass desktop on your standing desk frame. There is no way for you to safely attach a glass desktop to the UPLIFT Desk 4-Leg Desk Frame. 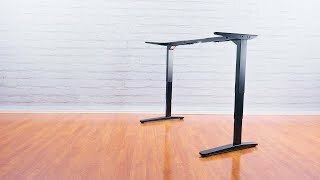 How heavy is the 4-leg desk frame? Will two people be able to move it? The 4-Leg Desk frame is solidly built, but two people should be able to lift it so long as your desktop isn't unreasonably heavy. Can I use the 4-leg frame with a circular top? You can use a circular top for your height adjustable frame as long as you distribute the weight of the top equally amongst all four legs. If the weight is not evenly distributed, then your desk will not be stable. $899.00 List Price: $1,200.00* The list price is the same as the MSRP (Manufacturer's Suggested Retail Price). It may not necessarily be the price at which the product is sold.